Germany confirmed their favoritism for the game against Portugal and took the important 3 points, after a difficult 1-0 win. The Portuguese team hit the posts twice during the game, but the Germans proved how pragmatic they are and scored the winning goal deep in the 2nd half, from a Mario Gómez header near the 72th minute. Portugal failed to start the EURO 2012 campaign with the right foot, after a 0-1 loss against Germany this Saturday night in the Arena Lviv, in Ukraine. Cristiano Ronaldo struggled to show off his talent and was far from the standards we're used to see from him in Real Madrid. Despite the defeat, the Portuguese team appeared to be solid defending and Fábio Coentrão ended being the best Portuguese player on the field, as he succesfully dynamized the left wing. 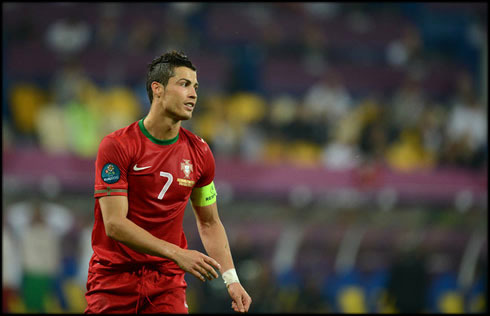 The lack of consistency in regards to score their goalscoring chances, proved to be fatal to Portugal. Germany won the game after a good header goal scored by Mario Gómez, in the 72th minute of the match. In 1990, the former English international player, Gary Lineker, stated that "football is a simple game, of 11 players against 11, but at the end, Germany always wins". This is a feeling that will keep taunting the Portuguese players, specially after their collapse against Joachim Low's side this Saturday night. With only 1 goal scored in the last 4 games (360 minutes), Portugal is definitely struggling to find the back of the net and the timing for this to happen couldn't be worse than this. Last night's game was actually an even and balanced one, despite what many experts were previewing after watching Portugal friendly games against Macedonia and Turkey. The German side never proved to be clearly supperior and truth has to be said that the best chances in the game lied to the Portuguese side. However, Germany's pragmatism and coldness contrasted with the Portuguese bad habit of struggling to finish their chances and will leave no room for mistakes for Paulo Bento's side in the upcoming games. The winning goal was scored deep in the 2nd half, in a period where both teams seem to have had slowed down the pace, as they were settling for a goalless draw. With 72 minutes on the clock, Bayern Munich's Thomas Muller made a cross to the far post that ended deflected on João Moutinho, allowing Mario Gómez to escape from Pepe's marking and head the ball to the back of the net. There was not much that Rui Patrício could have done and Portugal needed to react quickly as they were trailing by one, with roughly 20 minutes to be played. The Portuguese response came in terms of attitude and for the first time in the game, one of the sides clearly dominated the other. Running against the clock, Cristiano Ronaldo and his teammates forced Germany to retreat to their defense and managed to create a few good opportunities to equalize the game. However, all the Portuguese efforts ended up being inglorious as no one seemed to be capable to beat Manuel Neuer and Germany held on to the 1 goal advantage until the end. With Denmark's win over Holland (1-0), Portugal is definitely aware of how crucial the next game against the Danish will be. Portugal's fate in the EURO 2012 is not yet decided after this loss in their tournament's debut, but in order to aspire to get through into the quarter-finals, goals simply have to start coming in. Can Ronaldo be the man for that while playing wide at the wing as he has been doing, or should Paulo Bento move him to the center forward position and play with Nani and Quaresma/Varela? Real Madrid's season is now over and there are no games left in their schedule until the pre-seasons starts by July. Cristiano Ronaldo is now with the Portuguese Team, in the EURO 2012, and the next game will be against Denmark, next Wednesday (June 13). In the meanwhile, you can watch Ukraine vs Sweden, Spain vs Italy, France vs England and Ireland vs Croacia, all from our football live streams section. Cristiano Ronaldo will certainly be on the line-up, when Portugal faces Denmark for the EURO 2012.